Placing a bet on a football, soccer, baseball, basketball, hockey, golf or tennis game has never been easier thanks to the latest iOS, Android, Blackberry and Windows Phone sportsbook apps. Check out our reviews. Whether you own an iPhone, a Samsung Galaxy, a Nokia Lumia, an iPad or a Google Nexus tablet, we've got the right sportsbook app for you. At SportsBettingApps.net our aim is to provide you with a reliable guide to best bookmaker applications available today. Thanks to the latest advances in mobile gaming technology, it is now possible to place bets, deposit or withdraw money from your account, check the latest scores & results, get tips and even watch live games and horse races on your smartphone or tablet. Check out our free bets page for a list of the best no-deposit bonuses available today. 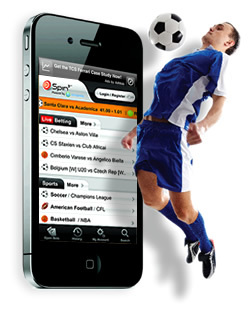 Check out our guide to the best sports betting apps for the Apple iPhone and iPod Touch. We also review the best U.S. friendly bookies for the Apple phone. Android is now the most popular mobile platform in the world. 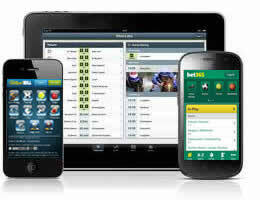 Find out which sports wagering applications work best on Android smartphones and tablets. Due to the popularity of Windows Phone devices like the Nokia Lumia & Microsoft Surface, bookmaker are now developing Windows Phone compatible betting apps. The success of new Z10, Q10 and PlayBook has renewed interest in Blackberry devices. Here we review the best Blackberry sports betting apps. We believe that gambling on sporting event will primarily take place on mobile in the future. More bookmakers will stream live sports to smartphones and users will be able to place bets by using fingerprint authentication. They will also incorporate social betting to make everything more interactive. The 2014 NFL American football season is under way so we've created a guide to NFL betting on mobile devices. We've reviewed the best NFL apps for social betting, tipping, news, statistics and game schedules. These are the essential NFL apps that every sports bettor should have on their phone. Peer-to-peer betting is the latest social betting trend that allows friends to wager against each other without having to involve bookmakers. The latest generation of mobile social betting apps allow you to challenge your mates to a wager, get tips from other bettors, compete for ranking and much more. For some online bookmakers, horse racing is just an after thought. Others specialize in horse race betting and provide a huge amount of information about races from around the globe. Here is our guide to the best horse race betting apps (US included) for betting, tips, forms guides and live streaming. We all know that a good tip is worth its weight in gold, so why not try any of these free sports betting and horse race tipping apps. Get betting advice from industry insiders and leading newspapers and publications delivered to your smartphone or tablet. A range of free apps are now available that allow users to watch their favorite sports live on their iPhone or Android. Free live streams are available for soccer, football, golf, basketball, baseball, tennis, F1, horse racing, rugby, GAA, boxing, hockey and more. A number of Australian based bookmakers cater for their home audience by developing quality sports apps that are compatible with virtually every type of tablet and smartphone These Aussie mobile bookmakers place a strong emphasis on Australian sports or leagues. Here is our guide to the best sports and horse race betting apps for United States citizens. These mobile sportsbooks welcome sports bettors from the U.S.A. and work on ALL types of mobile devices. NFL, NBA, NHL, MLB and every major league covered. Are sports betting apps free? Yes, most of the apps listed on this website are free to download and install. Some of them may have premium features like live sports streaming that require the user to place a small wager before they can access the live stream. Will these apps work on BlackBerry or Windows Phone devices? Yes, while most online bookmakers only develop native apps for iOS and Android, they also produce web apps that are compatible with most types of smartphones, including BlackBerry, Windows Phone and Nokia Symbians. These web apps can be accessed from any internet enabled phones and they look and function in exactly the same way as the App Store and Google Play versions. I live in the United States? Can I use the sports betting apps featured on this site? Unfortunately, most of the big European bookmakers are not permitted to accept players from the United States. Thankfully there are a number of mobile sportsbooks that accept U.S. citizens. Visit our U.S. Betting Apps section for a comprehensive list. Most of the others news, horse racing, odds comparison, live streaming and tipping apps can be downloaded anywhere in the world. Will my betting app work if I need to leave the country for a holiday or on business? That depends on the type of app you have installed. For instance, if you have downloaded a bookmaker app from the iTunes App Store or Google Play, these may not work when you leave the United Kingdom or Ireland because geo-location restrictions may apply. However, if you are using web apps you will not encounter this problem. For this reason, we always advise our readers to install the web versions of the apps rather than the App Store/Android Market versions. Can I watch soccer, football, horse racing, baseball, basketball, golf or tennis on my phone? Yes, many mobile bookmakers now offer live steams of U.K., Irish, U.S. and South African horse races proving you place a £1 bet on a particular race. There is also a wide range of sports streaming apps that allow users to watch Premier League soccer, the NBA finals, Wimbledon Tennis, Formula 1, the Super Bowl and thousands of other sporting events. Our live sports streams section contains useful articles on the best free and subscription apps for sports fans. Is it safe to download Non-Google Play (Android Market) apps onto my phone or tablet? Unfortunately, Google does not allow any real-money gambling apps in featured Google Play. Therefore Android users need to download the apk install files from third party sites. There is no way to guarantee the safety of these apps and there have been documented cases of viruses and other security vulnerabilities. For this reason, we would recommend users to only install apps for large reputable gaming companies. Sports fans have never had it so good thanks to the latest range mobile sports software that is designed to keep you abreast of all the action. It doesn't matter if you are a fan of the English Premier League, NFL, NBA, NHL, MLB, College Football, golf, NCAA Basketball, horse racing, cricket or motor sports, the latest sports betting apps to hit the market have everything you need. These apps are completely free to download and offer much more than just the ability to place bets from your phone. Whether you're a Manchester United, FC Barcelona or New York Yankees supporter, you can get up-to-the-second scores and results from every league, sports tournament or international match delivered to your phone in real-time for free. Want to know what time your team are playing tonight? Most bookmaker apps now also offer a complete fixtures list of upcoming sporting events. Ones of the greatest benefits of investing in a mobile device is the ability to watch live football, baseball, soccer, basketball or golf tournaments anywhere you like. Download any of these live sports streaming apps and they will instantly transform your phone into a pocket television that broadcasts live sports from EVERY country around the world, including the United Kingdom, United States of America, Canada, Australia, France, Ireland and Germany. Everybody loves to see bookmakers get taken to the cleaners. If you are serious gambling and want to win more of the time, you would be crazy not to use the combined knowledge of industry experts who offer free betting advice every day through a whole range of sports tipping apps. You can even leverage the combined knowledge of entire betting communities to see where the smart money is going. The apps features in our Betting Tips Apps section offer free advice on horse racing, darts, boxing, rugby, snooker, tennis and every other sports imaginable. DOES IT MATTER WHICH TYPE OF MOBILE PHONE OR TABLET I USE? No, it makes no difference whether you are using an iOS (iPhone/iPad/iPod Touch), Android (Samsung Galaxy Note, HTC One, Motorola Droid, Sony Xperia, Google Nexus ), Windows Phone (Nokia Lumia, HTC 8X, Samsung ATIV) or a BlackBerry (Z10, Z30, Bold, Q10). Most bookmakers only develop native versions of their apps for Apple and Android devices, however, they all provide web versions of their sports betting apps that look and function in exactly the same way. These browser based betting apps will operate identically regardless of which type of phone you choose to use.